Did you know 75% of businesses have incorrect information listed on at least one internet business directory? 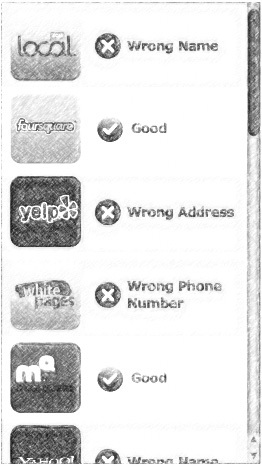 Whether it’s a wrong phone number, name or address, it’s bad for business. If this sounds like a lot of work, it is. Focus on your business and start by getting a free online listings report to see how accurate or inaccurate your online listings are or if you are in the directories at all. Help new customers find your business and maintain up-to-date online business listings. It’s time to fix your online listings in Macon, Warner Robins, Forsyth and surrounding areas in Georgia. So do you know how your company appears across the Internet? Is your business in the right local directories? Are your listings up-to-date?